So there I was standing in the Emeryville Apple store, with an Apple gift certificate (which I had had since Christmas!) burning a hole in my pocket, when I saw this great pile of boxes full of a new program called Stox. Not only were there piles of the boxes, there were big signs indicating that Apple thought this was a “must have” program for anyone interested in investments. So I surrendered my gift certificate and I bought the program. 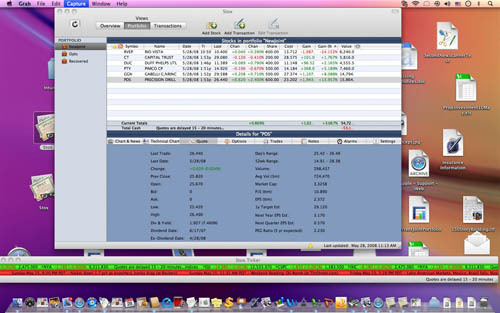 Stox promised a program that would give you a streaming stock ticker at the bottom of your screen (while you are performing other chores on the computer), an infinite number of customizable portfolios (either real or just “watchers”) and news bulletins about the market and individual stocks at the click of a button. The first problem that I encountered was the result of the fact that, without my knowledge, Apple had apparently offered a (severely restricted) trial version of the program. Although I registered the program and had paid for it in advance, each time I opened the program it warned me that I had only “x days” to buy it before my trial period expired. This problem was easily solved by a telephone call. The second problem was that the instructions for using the program were not very clear. There was, as with most programs, a Help button at the top of the screen. When I clicked on the Help button I got the message, “There is no help for Stox.” That did not augur well for the program. In theory you can have Stox open and showing only the stock ticker at the bottom of the screen while you read e-mail or perform other computer chores in the upper part of the screen. In fact, it’s hard to see how anyone could do anything productive while keeping an eye on the hard to read ticker numbers skittering across the bottom of the screen. This screen shot, however, shows only Stox open with an imaginary portfolio. If you click on any of the stocks listed the program will immediately bring up news stories about that particular stock. The price quotes, including those on the ticker, are 20 minutes old. I can do the same thing by opening my Schwab account, except the Schwab quotes are real time. The fact is that JoeSoft Engineering, developers of Stox, appeared to have put out the program while it was still a work in progress. It was not ready for prime time, and many of its parts simply did not work at all. Over a period of weeks I only opened it occasionally, and each time I did there were updates that enabled one or more of the supposedly original functions. The bad news is that, even though Stox now works more or less as advertised, I can get the information I need more easily and more quickly from my Schwab account. If anyone needs the information Stox provides and your broker doesn’t supply it, just change brokers. Try though I did, I was unable to find any way that, from the Stox program, one can sign on to one’s broker and buy or sell a stock. If you have to go to your broker’s Web site any way, the question arises: why bother with Stox? There is one other button I plan to click on as soon as this review is completed. It is one that, according to the label, will completely erase everything concerning Stox from my hard drive. Let’s hope it works without my having to download another update. If despite the above comments you want to buy Stox, it is available for $49.95 from the developer, JoeSoft Engineering (a Prosoft Engineering, Inc. company), http://joesoft.com/ or from Apple. It is also available for $40.99 from Amazon.com.